Mozilla will release Firefox 21 next Tuesday and with it comes H.264 support to the browser, or at least some users of it as it depends on which operating system Firefox is run on. If Windows 7 or newer is the operating system of choice, H.264 playback will be supported. Windows Vista users will get the support for H.264 in Firefox 22 and Mozilla is working hard to bring the technology to Windows XP, Mac and Linux as well. Support for Windows XP users via DirectShow may land in Firefox 24. You may remember that H.264 support is a controversial topic for Mozilla, not only because it is a proprietary format but also because of Google's dagger thrust in the back. What happened? Google back in 2011 announced that it would remove support for the H.264 format in Google Chrome in favor of the company's own WebM format. Mozilla and Opera jumped on the WebM bandwagon only to find out that Google never did, at least not until today. While Chrome was supporting both formats, all remaining browsers supported either WebM or H.264 but not both giving Chrome a clear advantage up until now. While support has not yet landed in a stable version of Firefox, Mozilla is already working on improving the technology further. Chris Pearce, software engineer for Mozilla, has been working on hardware accelerated H.264 playback. The feature landed in the most recent Firefox 23 Nightly builds and will make its way to the aurora, beta and stable versions of the browser once they hit version 23. Firefox will use the gpu of the system on Windows when possible to accelerate H.264 video decoding on Windows, which reduces cpu and power usage on the system. This should be especially useful for low-end systems as it will improve video performance when playing H.264 videos significantly. A preference is available that lets you toggle the hardware acceleration. 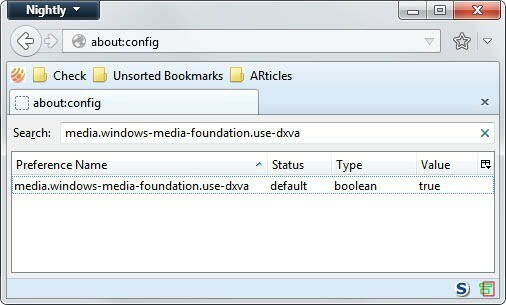 Type about:config into the browser's address bar and hit the enter key. Double-click the parameter to change its value. True means it is active, False means it is inactive. Will it work with hybrid graphic cards ? For those wondering, Mozilla compromised here not by allowing patented encumbered algorithms into Firefox, but by using H.264 support provided by the underlying OS/platform. I would expect that the H.264 support in Android would already be hardware accelerated (though I could be wrong). I guess I had assumed it already was HWA seeing as it’s just making an API call to the OS. Some of us have been using DXVA accelerated video players since before 2005 I can’t believe it took “this long” for them to add support into the browser. I guess well see Hi10 support in like 2021 at this rate. It wasn’t a technical reason, it was a philosophical reasons and the fact that Flash is ubiquitous on desktop browsers so that’s why it took so long. Funny you mention Hi10 b/c nobody uses it except pirate encoders and hobbyists. You will see manufacturers adopt H265 or whatever successor to h264 before you you see mainstream adoption of hi10. Recently had to switch to Aurora here, because Nightly Broke the extremely productive “FoxDie” Theme. Tabs broken, won’t open/close, locks up the browser. In such a situation I had been running Nightly, Aurora and UX, FoxDie died on UX also. I generally hate firefox persona’s except for they now work in LibreOffice, so there’s that. up to version=23.0a1&buildid=20130402030843 that I KNOW of.. but something recent broke it. Would be interesting to know why it stopped working. Could have something to do with Australis. The website is gone, the addon was only supported up to 18.0a1, so what’s Mozilla’s fault here? Abandoned extension is abandoned, deal with it. > Abandoned extension is abandoned, deal with it. I think I’ll get that as a tattoo.